the benefits are pretty simple. A good candidate screening will give you the hiring information you need and help protect you and your company. Both necessary to your company’s success. But did you know that despite understanding their value, you may be still be making some costly mistakes? Hiring someone you know or a “friend of a friend”? Or maybe you are thinking of hiring your neighbor or relative? No matter what the case, it is good business to never skip the background check! Your best tactic is to set a precedent right from the beginning. Make sure you are doing background checks on every single one of your potential employees, starting with your first. This goes a long way in warding off accusations of preferential treatment or discrimination in your hiring practices. 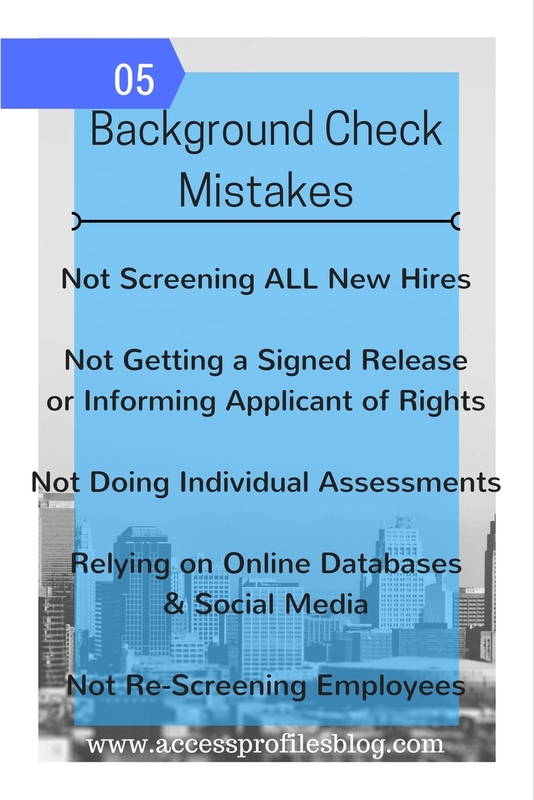 Using background checks in hiring also protects you and your company ~ and this is especially important for a small business! There are real consequences in making an unsafe hire. You may hire someone who steals from you or your customers. Or you may hire someone who has a violent past. This could ruin your small business. You also need to remember that who you hire is a reflection on you. They are often an integral part of the “face” of your company. Using background checks each and every time you hire is simply another tool in your arsenal to help avoid these issues. Find out more about the importance of employment screening in “If You are Not Doing Background Checks, You are making the Biggest Mistake Your Small Business can Make!”. There are rules when it comes to using background checks for employment screening. Not only are there guidelines as to what you can consider in making your hiring decision (think protected statuses like race, gender, and religion), but you also must recognize that your applicant has rights. One of the first things that can get you in hot water is not using a stand-alone background check release. For example, this document cannot be attached to or included with your application, or as part of any other hiring form. It is also crucial that your release is signed and dated by your applicant. In addition, you must be diligent in informing your candidate of their rights when it comes to the background check. They are entitled to know you are running a background check, to receive a copy of the report, and to know the name and contact information on the company who conducted the investigation. These rights are especially important if any “red flags” are found during the screening process that may keep you from denying employment. If this happens, your applicant must be notified and given the right to dispute or mitigate the findings. Ignoring any of these steps is a big mistake and can put your small business in jeopardy, especially from the EEOC (Equal Employment Opportunity Commission)! Learn more about what you can do to “fly under” the EEOC radar here! If your background check uncovers any information that can keep you from hiring your candidate, then you need to tread carefully. This is where Individual Assessments come in. An Individual Assessment is the process of considering any additional information provided by your applicant before making your final hiring decision. This can include weighing any mitigating information provided against the “red flag” or doing further research if they deny the adverse information. Your decision will most likely be based on whether your applicant’s additional information is relevant and if it has any direct bearing on the job. What is important here is that you are careful with your decision and document it every step of the way! Making a mistake at this juncture can open you up to charges of discrimination. Diligently using Individual Assessments when you hire is your best protection. You can learn more about using Individual Assessments in your hiring practices here! It can be very tempting for employers, especially Small Business owners, to try and cut corners and rely on online and social media information to screen potential employees. After all, it is a quick, low cost way to get what you need. Or, is it? There are many pitfalls and mistakes made with this way of thinking. Online databases are flawed. Many times they contain outdated or incomplete information. Incorrect charges, no final disposition, or even records listed that should have been expunged are often found. This can lead you to make a hiring decision without all the facts. Much the same can be said about using social media sites to research your candidates. While it might be hard to believe, but not everything you find on the internet is true! Social profiles may be hacked. Irrelevant or discriminatory information can be discovered. No matter the case, using this type of information as a basis for employment is a mistake. However, using both databases and social media judiciously, and as part of a more thorough package, does. Both are great as jumping off or starting points to a more traditional background check. Check out “Background Checks and Online Database ~ What You Need to Know” and “Social Media Check ~ the Forgotten Screening Tool” to find out more! 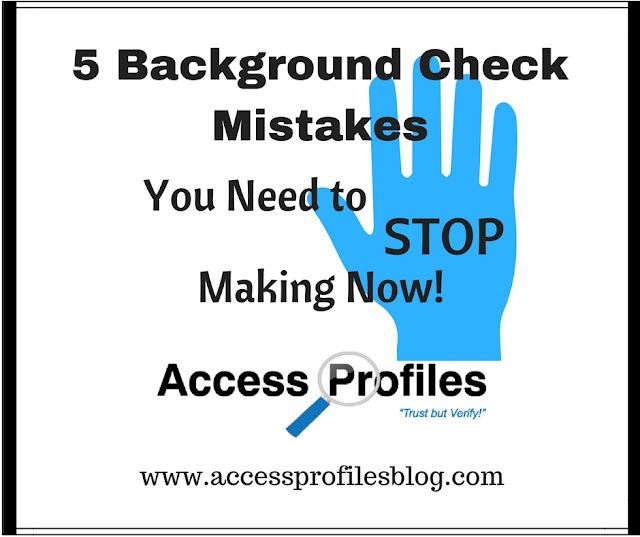 Thinking of employment background checks as a “one and done” is another mistake you can make. While your initial screening may have come up with a clean record, that may not always be the case. It is possible that your employee has since been convicted of a crime. Instead of being in the dark, it is sound business practice to periodically re-check your existing employees. This can be especially important if you are considering them for a promotor or transfer. Their new position may have more responsibilities or increased access to your company assets. That is why having a more up to date picture of your employee makes sense. Re-screening also shows your dedication to practicing your due diligence and protecting your company. This can go a long way in avoiding charges of negligent retention if your employee ever becomes involved in a workplace incident. You can discover more of the advantages and tips to re-screening existing employees here! Knowing all you can about any hire makes sense. And the best way to do that is through a sound background check. Your check will give you what you need to match your applicant with the right job. It will also help you avoid costly employment litigation. And, most importantly, it will help you protect the company you worked so hard to build. That is why avoiding these 5 costly mistakes simply makes good business sense! I will help you create the best hiring policy for your company. your needs and your bottom line! I have added Blog Writing and Editing to my services too!